Posted on 21, January 2019 by EuropaWire PR Editors | This entry was posted in Education, Germany, Internet & Online, Science, Society, Technology, Telecom and tagged #DLD19, AI, AI4 People, artificial-intelligence, Digital - Life - Design, digital networking, ethical AI, ethics, Ethics in AI, Facebook AI, Human-Centered Engineering, humanities, impact of AI, Joaquin Quiñonero Candela, philosophy, political science, Prof. Christoph Lütge, Prof. Thomas Hofmann, Sheryl Sandberg, social sciences, sociology, thoughtful use of AI. Bookmark the permalink. MUNICH, 21-Jan-2019 — /EuropaWire/ — The US company Facebook is supporting the efforts of the Technical University of Munich (TUM) to investigate the ethical implications of Artificial Intelligence with 6.5 million euros. 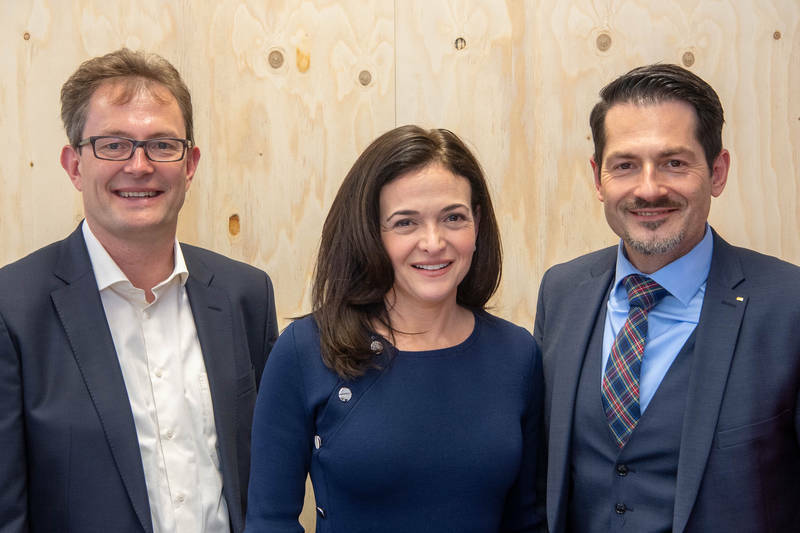 Facebook’s support for the new TUM Institute for Ethics in Artificial Intelligence was confirmed to Vice President Prof. Thomas Hofmann and Project Coordinator Prof. Christoph Lütge (Chair of Business Ethics) at the “Digital-Life Design” conference in Munich by Facebook COO Sheryl Sandberg. TUM´s commitment to the culture of value-based technologies led to the establishment of the Munich Center for Technology in Society (MCTS) as part of Germany´s Excellence Initiative 2012. The financial gift from Facebook to support the new Institute contributes to accelerating the implementation of the strategy. Prof. Christoph Lütge, holder of the Peter Löscher Endowed Chair of Business Ethics at TUM, defines the overall goals: “We want to supply guidelines for the identification and answer of ethical questions of Artificial Intelligence for society, industry and legislators”. Lütge was recently appointed to the Ethics Commission of the Federal Government on Autonomous Driving and to the European Expert Commission “AI4 People”. “Innovation cycles relevant to society are not possible without an ethical, legal and political overview,” says Vice-President Prof. Thomas Hofmann. Due to the long-term importance of the topic, TUM founded the new research institute under the direction of Prof. Lütge within the MCTS. Artificial intelligence (AI) opens up new functional and application horizons for technical systems through digital networking. In order to ensure the cultural and social anchoring of these partly rapidly advancing developments, TUM has launched an extensive expansion program for the fields of humanities and social sciences. Within this strategic direction, research and teaching will be structured in the context of “Human-Centered Engineering”, which will also involve disciplines such as philosophy, ethics, sociology and political science. The new TUM Institute for Ethics in Artificial Intelligence is supported by Facebook without further specifications.